The husband has just asked me why I want to bother to stay up this evening baking pirate cupcakes to take to one of my oldest friends. He suggested that I just hit the sack early and 'buy some in Sainsburys like everyone else'. He really doesn't appreciate food. He's definitely eating to live rather than living to eat. I'm the other way round. Which is why, after being awake since 3am, running at 5am, getting to work at 7am, having a pretty stressful day, coming home to make tea for Abigail (scampi, peas and pasta), playing with her and sorting out bedtime, I then found myself cooking two more different dinners - which, lets face it is a frequent occurrence in our house. See tonight I'd planned to have a go at Carbonara. Yet something else I've never made. I thought the husband would go for that as he likes spaghetti, cheese and bacon and I offered him garlic bread with it which would ordinarily seal the deal. But he just looked at me sceptically and said 'Have I had that before?" Yes, in a restaurant, many a time. "Can I have something else instead?' Do I have one toddler, or two? 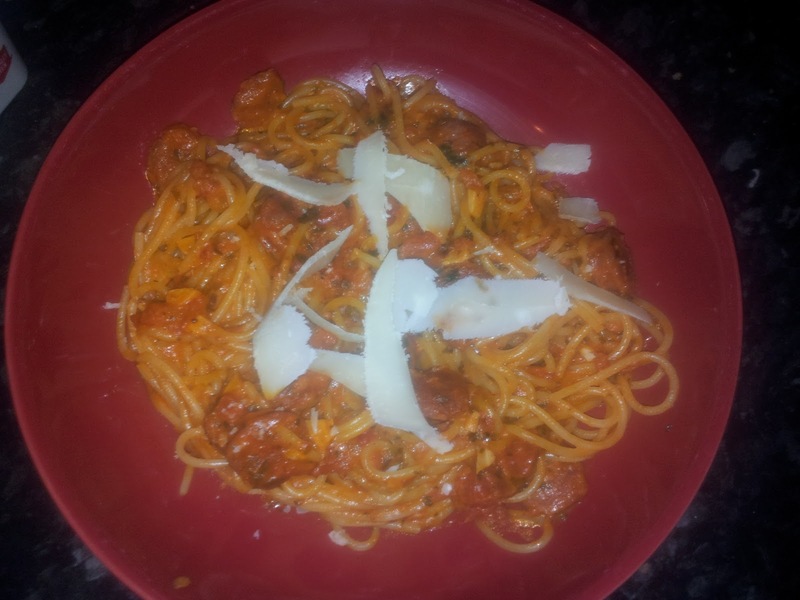 So despite me being absolutely shattered, he got sausages, egg and bacon and because I didn't have to please him, I made Rachel Allen's fab chorizo pasta. Thank you to Ocado for delivering me Unearthed Mini Cooking Chorizos and all the other bits and bobs my fridge was devoid of shortly before the critical dinner decisions were made. I shall be noshing on the rest of those divine little sausies, simply baked with some home made bread on Sunday. Made a couple of changes to the recipe. Used chilli oil instead of dried chillies, didn't add rosemary as I didn't have any and used Garden Gourmet parsley as I'm tired of those 'Growing Herbs' dying on me before the week's out. I also served it with spaghetti instead of the recommended rigatoni - but pasta is pasta is pasta some days in my book. In truth, it's probably easier to serve with spaghetti for one portion - I'd probably use pasta shapes if I was serving to more people. In fact, this was so lovely and 'inoffensive' that I shall be making it for tea on Saturday for the hubby with a mix of chicken and chorizo. Top marks. Here's the recipe.